Spend a weekend with professional wildlife photographer John Ehrenfeld in the Sierra Valley. 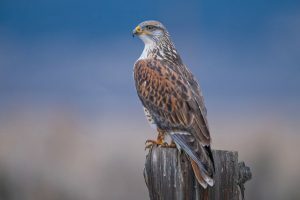 Target species include Rough-legged and Ferruginous Hawks, falcons, and eagles. There are 25 eBird hotspots for Sierra Valley, which straddles Sierra and Plumas Counties. Plan to spend all day Saturday and Sunday in the field. John will provide technical and creative advice for photographers and will lead a friendly critique session to review the day’s photographs on Saturday evening. Two-night stays are required at all the lodging options in the area. A list of lodging suggestions will be sent to participants soon after they register. The group will meet at the intersection of highways 89 and 49 at the Globe Hotel parking lot at 11 am on Saturday. Participants will stay over Saturday night and return to the field on Sunday morning. Carpooling is recommended. Fee is $250 for GGAS members and $300 for others. Accommodations and meals not included in the course fee. Weather: Rain and fog can add ambiance to nature photography so we’ll address those challenges in the field like the pros do. Heavy snow forecast will cancel trip and it will be rescheduled. No minimum standards for photo equipment, but a digital SLR with a minimum reach of a 300mm lens will be helpful. Click HERE to register online. Once the class is full, you may register to be on a waiting list. Registration closes on Wednesday, February 20. Six Thursday evening classes, February 28 to April 5; 7 to 8:30 p.m.
Six three-hour field trips on the Saturday following each class, 8:30 – 11:30 a.m.
BART in Berkeley. Free parking in the lot behind the center. Click HERE to register online. Once the class is full, you may register to be on a waiting list. Six Thursday evening classes, April 18 to May 23; 7 to 8:30 p.m. This great introduction to bird-watching will teach you about the migrants and seasonal visitors, as well as year-round residents. Instructor Anne Hoff will familiarize you with the tools of the trade — binoculars, field guides, scopes, and the best local places to watch birds. In Monday evening classroom sessions, she’ll introduce you to different kinds of birds. Then on the following Saturday, she’ll help you spot them in the field! No prior birding experience required. Note: You will need to own or borrow binoculars for this class, but they are not necessary until the first field trip. Five Monday evening classes, March 25 to April 22 – 7 to 8:30 p.m.
counting/monitoring) activities and current bird conservation issues. Area hosts a rich array of songbirds: year-round, winter residents, and summer residents. male and female song? How do the young learn their songs? Registration for both classes opens on Wed., March 6 at 9:00 a.m.
Two sessions of the popular class “Birds of the Sierra” will be offered again this year. Both will be held at and near Yuba Pass, on highway 49 between Sierra City and Sierraville, in Sierra and Plumas Counties. Classes include six half-day field trips to different habitats in Sierra Valley and its surroundings, as well as a lecture and dinner at SFSU’s Sierra Nevada Field Campus in Bassetts. An optional evening trip to hear booming Bitterns and winnowing Snipes may be arranged. Birds we may see include many Sierra specialties: Swainson’s Hawk, Sandhill Crane, White-headed and Lewis’s Woodpecker, Williamson’s Sapsucker, Yellow-headed Blackbird, Calliope Hummingbird, Empidonax flycatchers, Cassin’s Finch, Mountain Chickadee, Mountain Bluebird, Sage Thrasher, MacGillivray’s and Hermit Warbler, Western Tanager, Green-tailed Towhee and Brewer’s and Vesper Sparrow. June 6th to noon on Sunday June 9th. Thursday June 13th to noon on Sunday June 16th. Each class is limited to 25 people. The fee of $175 (or $200 for non-GGAS members) includes one dinner at SFSU campus. Room and other meals are not included in the fee. Bob Lewis will send a more detailed itinerary and information about where to look for lodging after registration. Questions? Email Bob Lewis at bob@wingbeats.org. Click HERE to register online for Session 1. Once a class is full, you may register to be on a waiting list.